More and more people like to travel with their pets these days, and vacation rental companies are responding to that trend by accommodating dogs at more of their properties and even catering to these customers with pet-friendly extras. 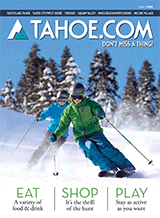 One such company in the Tahoe area is Tahoe Moon Properties. They offer more than 20 dog-friendly homes, and they take their dog-friendliness to a whole new level by providing just-for-the-dog extras at each property. Pretty awesome, right? I thought so. 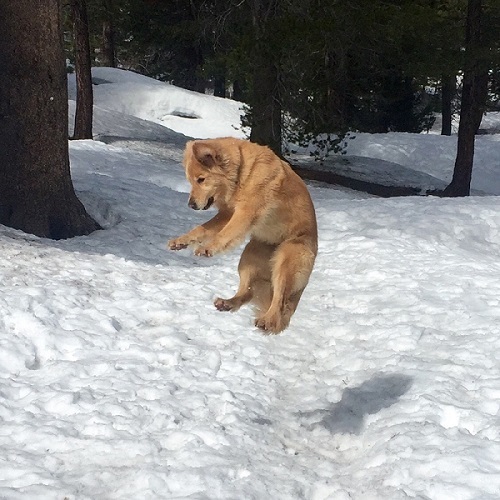 In fact, I was so excited to learn about this that I tracked down Tahoe Moon's owner, Jill Schott, to ask her opinions and thoughts when it comes to enjoying Lake Tahoe and taking advantage of its beauty with the four-legged member of the family. Here's what she had to say. Me: What does Lake Tahoe offer visitors with dogs that other areas may be missing? Jill: Not only are there a multitude of both winter and summer activities for us humans, but there are also many places to enjoy activities with your dog. 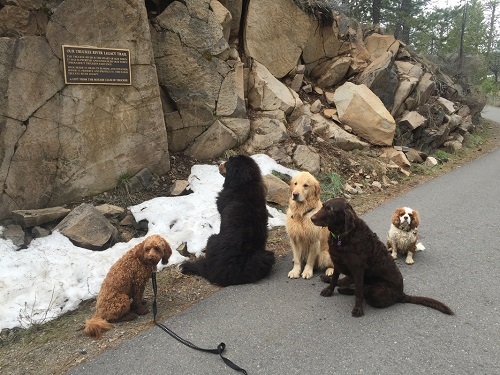 Hundreds of dog owners visit Lake Tahoe each year with their furry friends, and you will find it hard to find a resident who does not have their own pup. In addition to the outdoor splendors for dogs, there are a huge number of rentals, hotels, restaurants and pet lodges that welcome your four-legged friends. Which dog walking trails do you recommend for people who are hoping for a leisurely stroll with their dog? How about for a more strenuous walk? I love Page Meadows, a part of the Tahoe National Forest. It is an easy and beautiful hiking area on the west shore of Lake Tahoe. It is great for snowshoe beginners in the winter and wildflower enthusiasts in the spring and summer. It's also a great place for dogs and views, offering wide-open panoramas of Lake Tahoe and the Sierra crest. Another favorite of mine is the Brockway to Watson Lake trail, which is a 13.4 miles round trip and is classified as a strenuous hike. The Brockway trailhead is on Highway 267 about 0.5 miles south of the summit. This dog-friendly trail is open to mountain bikers, hikers and equestrians, but it's a little more complicated, so I will give you the lowdown on the best route. The first 4.5 miles are gentle ups and downs through white fir and Jeffrey pine forest. In this section you will cross several forest service roads (including Forest Service Road 73, commonly known as the Fiberboard Freeway); make sure you are rejoining the actual trail after each of these junctions. After 4.5 miles there is a short 90-yard spur trail on your left-hand side, which takes you to a large rock pile that offers spectacular views of Lake Tahoe. During the next 2.2 miles, you will be heading gently up through beautiful wildflower meadows and forested areas. After passing several streams, you will arrive at Watson Lake. 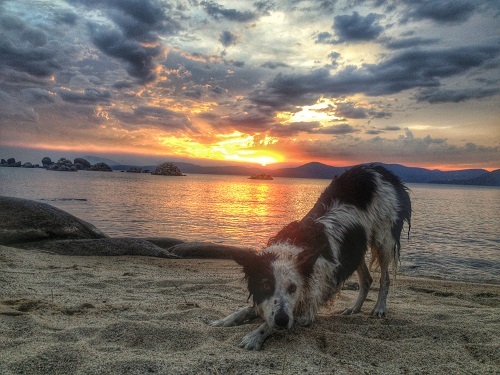 What does Tahoe Moon offer for dog owners? We have more than 20 dog-friendly properties, and each house has a dog basket filled with dog necessities, dog blankets and towels, pick-up baggies, lint brushes (for our shedding friends) and a dog-friendly guidebook to Tahoe. We also work closely with a great professional pet-sitting company called Squirrel!!. The owner is known as the dog whisperer and offers the best doggie outings and play dates there are! She picks up dogs at your home, lets them they play and hike with other dog buddies and then returns them to your house, happily tired out. We often offer deals, promotions and social media contests with Squirrel. Do you have a favorite memory that you or a client experienced while enjoying Lake Tahoe with the family pet? My favorite memory is taking my dogs to Donner Lake to the special dog beach where all the dogs hang out and swim. One time my youngest dog, Bowie, swam on his own to a little island for the first time, and everyone on the beach started clapping for his big puppy achievement. Is there any advice you would like to share with readers in regards to traveling with a beloved pet? Tahoe is one of the best places to bring your fur friends, just make sure they have lots of water and a comfortable place to sleep because they will need it after a fun day in Tahoe. Also, don’t be afraid to ask locals the best places to bring your dogs because we know all the insider scoop you might not find in a book or online.